Gary Kelley is intrigued by monotypes--inspired by Cezanne and Degas. He spoke about how monotyping was a social activity amongst artists who got together to make these prints. Monotype party! Maybe this is a new sketch crawl? Sounds like fun. This is a very simple process which I am sure can get more and more complex as you crank up surfaces, finishes etc..but there is a kitchen table mode which Gary demonstrated this morning. Gary taped an enlarged xerox of an image from his sketchbook to the back of the piece of plexiglass he was going to create his print on (reading up through the glass). He reminded us that in planning for your print to consider what is right reading citing type, guitar playing, and little details such as how shirts button etc. Plan your work, work your plan. And think about how it might look flipped. He mixed a nice neutral from raw umber and ultramarine blue on the other piece of plexi. When it was where he wanted it to be, he took the brayer and rolled out some ink. He then rolled out a mess of ink on top of the plexi with the image taped on the back(let's call that the plate). He then took a rag--wiping away areas to make the outside shape, pulling out aspects of the illustration. He continued to work into the illustration using a series of brushes either dry or with a tiny bit of turpenoid. He uses all sorts of tools, textures etc to work into the monotype. Additionally, he will use the brayer to add color, add texture etc. The cool thing is that you can add more than one color per plate--so that you can make the picture in one pass (or if you are ambitious, you can continue to work into the image on the final print, or with further registration). It is all very intuitive and experimental. Gary told us about rolling out ink on his plate, laying crumpled oilskin on top, running it through the press and using that initial textured ink on the plate as a place to start his monotype. Cool. The idea that you can prep your plate on the press...just like printing on paper. That gets the gears going for me. Gary had been interested in monotypes for a while but the first real one was an image he did for Interview with a Vampire illustration (featuring Tom Cruise). It was very simple--black defining the face and frame of the face. Gary went in with a pastel and colored the mouth and surround which got right to the point. He goes in spurts where he creates a body of images...and then gives it time, and does more later. He is mainly working in oils these days (pastels are on the shelf, so I am delighted we saw the pastel demo in 2005/summer as he is just not using or demonstrating them). During one of our evening chats with Gary, he was very positive about George Pratt, an illustrator and well-loved and respected teacher at the Illustration Academy (and I think Ringling). George is passionate and his monotypes are more slashing, more spontaeous. 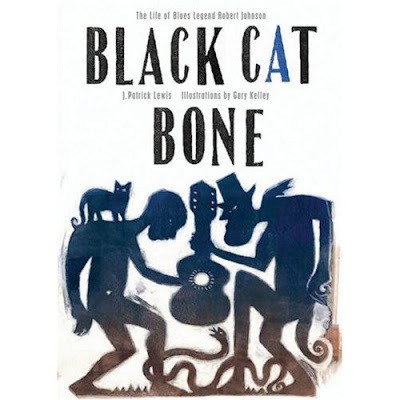 The book above, Black Cat Bones, is a project instigated by Gary Kelley about the influences and art of the guitarist, Robert Johnson. All the illustrations are monotypes--some inspired by folk art, other out of the hand and head of Gary Kelley. After seeing his simple presentation--looking at those Robert Johnson images are absolutely mindblowing--multiple colors and textures, some complicated illlustrations, some simple and strong. The book is a jewel--probably a purchase in the near future.